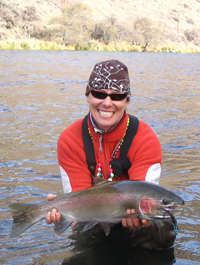 Professional fishing guide Renee Faltings will bring the adventure of fishing for steelhead on the Deschutes River in central Oregon to the next meeting of the Hemingway Chapter of Trout Unlimited. The meeting is scheduled from 5-7 p.m. this Thursday at Whiskey Jacques’ in Ketchum. The public is invited and admission is free. Faltings has been a Ketchum resident for the past three years, but she’s originally from Oregon, having grown up near the Deschutes. It remains her favorite “home river” and she has mastered ‘steelheading’ with a fly rod some 100 miles of the lower waterway. Trout Unlimited’s mission is to “protect, reconnect, restore and sustain our cold water fisheries and habitat.” The Hemingway Chapter holds monthly meetings with free presentations from September through May. For more information, contact Bob Law at 622-4613.